Don’t get too excited, but the median price paid for a Southern California home rose above the year-ago level for the second consecutive month in January, according to DataQuick. The median price paid for all houses and condos sold in the Southland last month was $271,500, down 6.1 percent from $289,000 in December, but up 8.6 percent from $250,000 a year earlier. It was actually the first month-to-month decline in eight months, though that was driven more by seasonality and foreclosure sales than any real underlying trend. “The January stats underscore just how atypical this market remains. A huge chunk of what’s selling is still distressed,” said John Walsh, MDA DataQuick president, in the release. 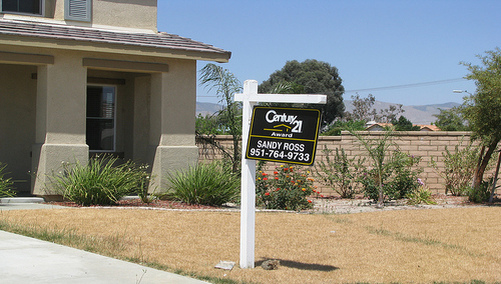 More home sales are occurring in the cheaper inland areas as well, with 35.2 percent of sales in the hard-hit Inland Empire (Riverside and San Bernardino counties), up from 32.3 percent in December. Meanwhile, jumbo financing on higher-priced homes remains constrained, with the loans accounting for just 14.2 percent of all home purchase loans during the month. And that includes anything over the old conforming loan limit of $417,000, not the new conforming-jumbo limit. Buyers who appeared to pay in cash accounted for 28.9 percent of January sales, up from 25.7 percent in December and 22 percent in January 2009. Home “flipping” also trended higher during the month, with 3.5 percent of home sales previously sold between three weeks and six months prior. In total, 15,361 new and resale homes closed escrow last month in Los Angeles, Riverside, San Diego, Ventura, San Bernardino and Orange counties, down 31.2 percent from December’s 22,328 sales, but up 0.9 percent from the 15,227 sold in January 2009.